The year 2011 ends with some good news for the Harsharan Foundation — Alain Daniélou Study Centre. Ehud Sperling, the Founder-President of Inner Traditions International, one of the most important U.S. publishers in the English-speaking world for works on religion and spirituality, has kept his word. As promised before last summer, his publishing house will from now on be offering all its Alain Daniélou collection as e-books. Wherever they may be in the world, English-speaking readers of Daniélou can consequently, with a single click, have at their disposal within seconds such major works as Myths and Gods of India, Hindu Polytheism, or Virtue, Success, Pleasure and Liberation, Traditional India’s Social Structures. In the past few months, the publishers Fayard, of Paris, have done the same with two titles: L’histoire de l’Inde and Shiva et Dionysos: la religion de la nature et de l’eros – De la préhistoire à l’avenir, now both available in Kindle format. Both these initiatives are the fruit of the same policy promoted by the Foundation, which should see completion in 2012: the digitisation of all Alain Daniélou’s works. In French, digitisation is already in progress on the three plays of the Théâtre de Harsha as well as on the Chemin du Labyrinthe and several other texts by Alain Daniélou that are currently unobtainable. All these documents will soon be available on a dedicated database, scheduled for launching during 2012. With regard to the traditional paper version of the Chemin du Labyrinthe, we are also pleased to advise our readers that it will soon appear for the first time as a paperback. At the same time, interviews are now underway for the preparation of a documentary on Alain Daniélou, taking place in Switzerland to Paris and New York. Last September, Palazzo Rospigliosi at Zagarolo, where the Alain Daniélou Centre is located, hosted an Indian dance programme by Raghunat Manet to celebrate the fiftieth anniversary of our presence in this small Italian town. 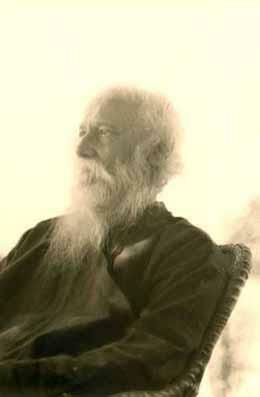 The celebrations for the 150th anniversary of the birth of Rabindranath Tagore also gave rise to numerous concerts and events sponsored by the Foundation. Lastly, as part of the major exhibition entitled Indian Highway, open up to January 23, 2012 at the MAXXI, Rome’s great new modern art museum, the Foundation has also sponsored an event including the choreographer Shantala Shivalingappa and a group of Indian musicians. The Foundation now employs eleven collaborators (several of whom part-time) in the pursuit of its aim, consisting solely of allowing anyone who so wishes to consult Alain Daniélou’s work at the source and become familiar with the world that he frequented and described. The digitisation of his written work should not only ensure its perpetuity, but also introduce Alain Daniélou to new readers. Creating a page dedicated to Alain Danielou on the Facebook social network where you will find all the latest news related to Harsharan Foundation – Centre for the Study Alain Danielou. Editions Fayard and Inner Tradition International recently released the sales of their book E Book by Alain Danielou. About 100 recently-discovered photographs of the author and playwright Rabindranath Tagore, revered in Bangladesh and India, have been put on display in the Bangladeshi port city of Chittagong to mark the 150th anniversary of his birth this month. 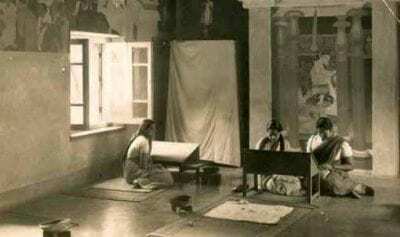 The pictures show the poet and artist, who died aged 80 in 1941, in a new and more intimate light at the Viswa Bharati university he founded in Santiniketan, a small town in the Indian state of West Bengal. “They are a glimpse of life in the golden age of the university,” said Samuel Berthet, director of Chittagong’s Alliance Française. Mr Berthet discovered the photographs while sorting out Mr Danielou’s archives at his house in Italy. Many of the pictures portray campus life at Santiniketan with teachers and students working together. 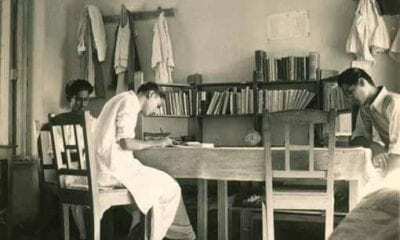 The university’s more recent alumni include Nobel prize-winning economist Amartya Sen.
“We don’t want to commemorate Tagore as something of the past – he is of the present,” said Mr Berthet. ….”An exhibition, “Tagore: The Universal Message”, curated by contemporary history scholar Samuel Berthet, a French national, has brought 97 vintage snapshots of Santiniketan and Visva Bharati in its early years from the archive of noted Italian photographer Alain Danielou to comment on Tagore`s approach to universality in education…..
“Tobu mone rekho jodi duure jai chole…” is a much-loved, soulful Rabindra Sangeet. But its charm multiplies manifold when you hear the bard rendering it himself in his stirring voice. The French Gala Evening, organised by the France Bangladesh Chamber of Commerce and Industry (CCIFB) at Radisson Water Garden Hotel in Dhaka on Saturday evening, was where this number from the original archive, sent solely for the occasion, was played as part of the exclusive film of Tagore in France. The event was split in two sessions — “Tagore and France” was all about the poet’s French connection, the history, literature and music while the second session featured “Riturango”, a cultural show on classical composition, recital, song and dance. It was indeed a rare opportunity to be able to listen to the great poet sing his own songs in the documentary film, “Tagore and France”, presented by Dr. Samuel Berthet, the Director of Alliance Française in Chittagong…….